I was thinking recently, that there are some products I use a lot, some of which use every single time I do my makeup. I have tried to find alternatives to some of these but I am never happy with them, I always go back to the originals. So this is my "desert island discs" of make-up! This is a very recent one in my collection but I love what It does to my lashes so much that the other 5 mascaras I have floating around probably wont see the light of day again. For a long time I was using MAC Prep and Prime Lash with a mascara on the top (usually one from S&G, Benefit or MAC) but it always made my lashes feel too thick and heavy. Without the primer they didn't look how I wanted. With the Tony Moly mascara I only need one coat to achieve long dark lashes. I already have quite thick lashes so length is more what I look for and this delivers everything I want in one quick sweep. (This is the first shadow in the palette...that's the only one that's really been used) I have been using this colour as a brow highlight for years now and I am dreading the day it runs out. It matches my skin tone beautifully but because of it's light shimmer it more dimension and texture. I am still searching for a dupe in both colour and application but am yet to find one! HELP! I prefer lipgloss to lipstick but I hate how sticky a lot of it is. I absolutely love these, they're so creamy and aren't sticky at all. The colour pay off is lovely. It gives the lips a pinky glaze without feeling heavy and too bold. It's amazing for daily wear and as ever, the packaging is beautiful, really slick and minimal. I actually got this second hand for a few quid. There isn't any where near me that sells Too Faced. I have been using UDPP (Urban Decay Primer Potion) for about 4 years now. In the last year or so I have been hearing a lot about this eyeshadow primer. Some of the Beauty Bloggers / Guru's that used to use UDPP started to switch to the Too Faced Shadow Insurance. I felt it was time to see what the hype was about. I definitely prefer it to UDPP although I think they both do their job well. I find this primer a little thicker which I prefer and it also makes colours slightly bolder then my UDPP does. My inner corner would be sad without this eyeshadow. I cannot use anything but this for my inner corner highlight. The colour is a white-gold-shimmer. I've used golden and white shadows but neither pleases me the way Nylon does. It's a bit of a mash up of both and provides a gorgeous highlight without being too "garish"
So, quite a few MAC products in this, I've been a big user of the brand for many many years now, and although I tend to buy a lot less of it now I still have a lot hanging around, I love that their stuff is so pigmented you can use so little. This means it lasts so long, definitely value for money. These items are all simple staples for me. Mascara, brow and inner corner highlights, subtle lipgloss, primer and an eye pencil! I could easily create a look with these products that I would love! 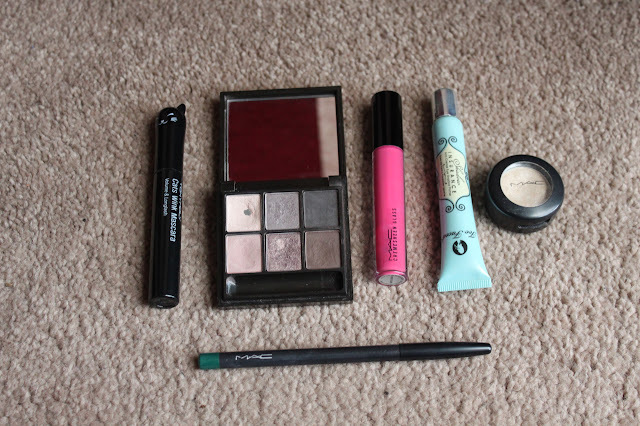 So for me, these are my essentials, the bits I simply can't live without! PS lol love your take on single ladies!